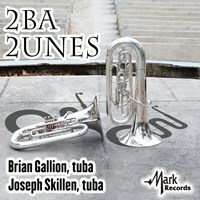 Brian Gallion (tuba) and Joseph Skillen (tuba) recently released 2ba 2unes, an eclectic CD of tuba duos and tuba-centric ensemble pieces. The recording, officially released on November 3, 2017, will be available on Mark Custom Recordings (52098-MCD) and at NaxosDirect. Engineering for the project was by Robison Productions. We did the initial recording sessions for this project in 2010 at the LSU School of Music Recital Hall. There was a final recording session followed by editing and mixing in 2013. Then life happened. If I remember correctly, there were new jobs started, children born, and mechanical licenses that proved difficult to track down. But, this delightful collection of music is finally available for all to hear. Please be sure to check it out!